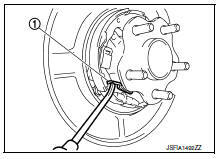 If equipped with drum brakes, refer to BR-42, "Removal and Installation". Clean dust on the parking brake shoes with a vacuum dust collector to minimize the hazard of air borne particles or other materials. Remove rear wheels and tires using power tool. Refer to WT-47, "Adjustment". Remove disc rotor. 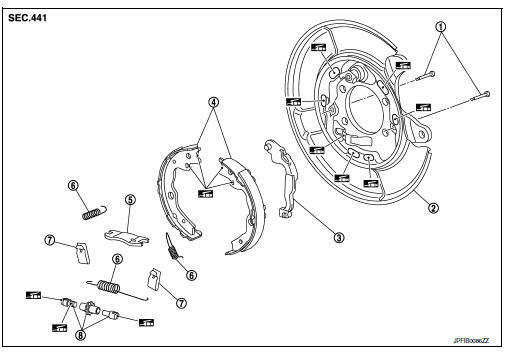 Refer to RAX-7, "Removal and Installation - Disc brake". Parking brake must be completely released before removing rotor. Remove return springs (1) from the top of the parking brake shoes. 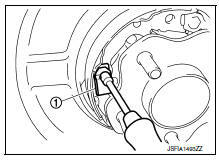 Remove the return spring (1) from the lower side of the parking brake shoes. 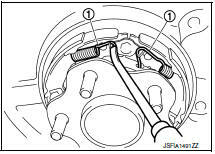 Remove springs (1) from the parking brake shoes. Do not drop the removed parts. Remove parking brake shoes, adjuster, brake strut and toggle lever. The front parking brake shoes are made of different materials than the rear parking brake shoes. Install the parking brake shoes in the proper location. Press the rear cable spring (1) against spring tension to remove rear cable (3) from the clamp (A) of toggle lever (2). Do not bend rear cable. Remove back plate (if necessary). Refer to RAX-7, "Removal and Installation - Disc brake". Apply PBC (Poly Butyl Cuprysil) grease or silicone-based grease to the back plate and brake shoe. The front parking brake shoes are made of different materials than the rear parking brake shoes. Install the parking brake shoes in the proper location. Assemble adjusters so that threaded part is expanded when rotating it in the direction shown by arrow. Shorten adjuster by rotating it. When disassembling apply PBC (Poly Butyl Cuprysil) grease or silicone- based grease to threads. Check that the component parts of the parking brake shoe are properly installed. Check parking brake shoe sliding surface and drum inner surface for grease. Make sure that grease does not adhere to the friction mating surfaces on the parking brake shoes and disc rotor. Check thickness (A) of lining. Wear limit thickness : Refer to PB-13, "Parking Drum Brake". Check inner diameter (B) of drum using suitable tool. 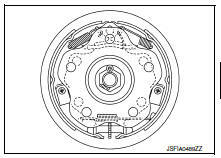 Wear limit of inner diameter : Refer to PB-13, "Parking Drum Brake". Check the following items, and replace the parts if necessary. Lining for excessive wear, damage, and peeling. Anti-rattle pin for excessive wear, damage and rust. Return spring and spring for settling, excessive wear, damage, and rust. Toggle lever and brake strut for excessive wear, damage and rust. Visually check inside of the drum for excessive wear, cracks, and damage. Adjust the parking brake lever stroke. Refer to PB-4, "Inspection and Adjustment". Rotate the disc rotor to check that there is no drag. Install the plug. If any drag is found, follow the procedure described below. Adjust parking brake stroke again. Adjust the parking brake shoe. 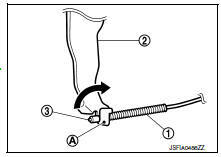 Refer to PB-6, "Adjustment - Disc Brake".